AAP has the capability of quickly model different sound absorbing and vibration control materials based on the database of tested material. These materials include an extensive variety of foam, barriers and damping materials and they have been collected throughout the decades. Microperforated metals and facings can also be modeled on a material level. 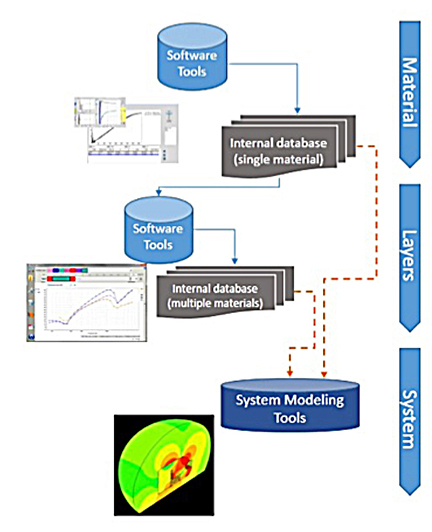 There are times in which a single material is not enough to address the noise and vibration problem and for this reason AAP has developed a layered approach using sophisticated software to model the effects of different acoustic laminates. AAP has the capability of modeling a full system inclusive of acoustic and structural interactions. 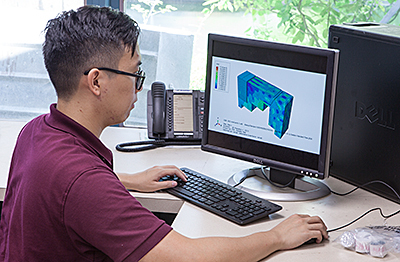 Utilizing finite element software we are able to determine the structural behavior of a part and model the medium (typically air) around it. The acoustic behavior can be computed for a different type of conditions. Acoustic driving functions can be defined as sources using an acoustic impedance. Acoustic materials from AAP’s database can be used in the 3D model and may contain the full temperature and frequency dependent behavior typical of such materials. AAP typically validates the model using experimental testing representative of the system behavior, in this way closing the loop and being able to provide a complete solution of the noise and vibration problem.